Hockey Plumber: Season of Loss For the Red Wings. More To Come? When the lights had finally been turned down, and the last reveling Sharks fan had been, at last, escorted from the building, the Detroit Red Wings remained in the visiting locker room. It marked the first time in three years that the team will not make their way to the Stanley Cup Final, the first time that they had to answer questions about where it all fell apart... and the first time that they will be faced with legitimate questions about their immediate future. The Wings started the '09-'10 season with questions about losing: How would they deal with having lost in the Final. How would they deal with losing their leading goal scorer, Marian Hossa, their emerging forward Jiri Hudler, and the versatile Tomas Kopecky? Once the season was underway, Detroit had lost their first two games in their second home, Sweden, and finished the month of October with seven losses. Then, the injuries began to pile up. Zetterberg, Franzen, Holmstrom, Filppula, Kronwall, Ericsson, Maltby, etc... all lost games to injury, many of them, significant time. During the dark days of lost man games, Detroit was in danger of missing the playoffs for the first time since Al Gore invented hockey. Once at near full-strength again, the Red Wings went on a tear and were once again primed to do damage in the post-season. However, they struggled mightily in round one with the surprisingly strong Phoenix Coyotes. In the next round against the Sharks, the Wings appeared to run out of gas. Detroit looked like a team that has played more games than any other team over the past few seasons. They were shockingly inconsistent at times, and very uncharacteristically leaky defensively. After bowing out much sooner than their fans have become accustomed to, what will become of the team that has become the gold standard in the NHL? First, longtime captain and blueline anchor, Nicklas Lidstrom must decide if, at 40 years old, he wants to face the rigors of yet another NHL season. It would be season number 19 for Lidstrom. All spent in a Red Wings uniform. Aside from Lidstrom, forwards Tomas Holmstrom, Todd Bertuzzi, Jason Williams, defensemen Andreas Lilja and Brett Lebda are scheduled to become UFAs. Detroit also faces the possibility of losing team VP Steve Yzerman to the Tampa Bay Lighting. 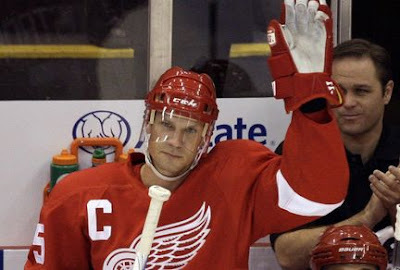 Losing their captain, and "the Captain", Stevie Y all in one season may be too much to handle for many Red Wings fans. Yet, GM Ken Holland, who always seems to have answers, doesn't sound shaken. "It's harder and harder to make the playoffs. That's not the standard we set long, but I think we've got the nucleus to take a legitimate run at it again next year." With all the potential changes facing the organization, Holland calmly processes it all with an eye fixed on just next season. Chin up Wings fans, if Kenny Holland doesn't seem worried, then neither should you. As much of a comfort as that notion should be, we realize that it still didn't soothe the pain of losing. "It's always disappointing when you don't go all the way," Holland said. 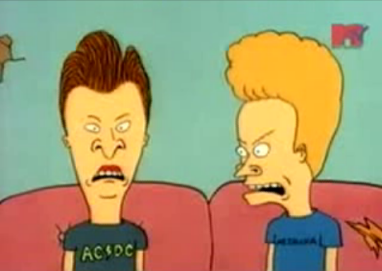 In the background, Beavis begrudgingly, loudly and repeatedly agreed with Holland, while Butthead's comments were unintelligible, due to his continual laughter. Tiger Woods was not available for comment.